Celebrating 80 years of Marvel! From the front lines of World Wars, to the first super hero crossovers, sample our earliest days in comics with these Golden Age hits! The evolution of an industry starts here! The four-color comic world is taken by storm! This inaugural issue contains the first appearances of the android Human Torch, and Sub-Mariner, lord of Atlantis! Plus, 12 pages of jungle action with Ka-Zar the Great! Meet the caped crusader Angel! See Namor the Sub-Mariner take on the surface world, (and gripe about it)! Then, a yarn from the Ole’ American West starring the Masked Raider! The Fiery Mask is born in one of the most dizzying super hero origins to date! And, more wartime wonder courtesy of Barney Mullen, Sea Rover! 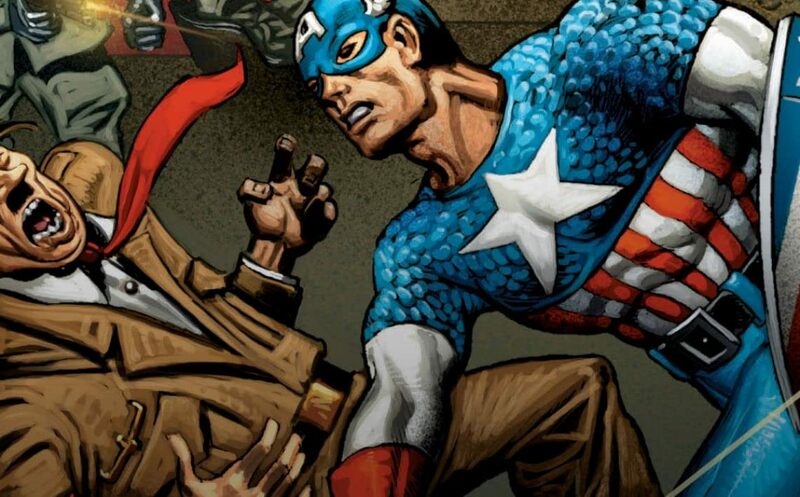 A hero clad in red, white and blue decks Hitler. Simple and effective. Legends Joe Simon and Jack Kirby introduce one of America’s most enduring cultural landmarks! The Nazis attempt to undermine and conquer an underwater village, but will have to get through the Prince of Atlantis first! Check out the super strange appearances of the early Atlanteans! Behold! A cross-title collab between the Human Torch and Sub-Mariner! Fire meets water in an elemental showdown told through both perspectives! Read through #9. Jim Hammond and his kid sidekick Toro must quell Sub-Mariner’s plans to become the next Napoleon! Side note: the Human Torch could have a second career as a skywriter! Introducing the first class of Golden Age heroes! In this issue, the origin of Defender and The Whizzer! Bringing together all of the decade’s biggest hits under one roof, Captain America and Bucky, Prince Namor the Sub-Mariner, and the Human Torch and Toro are joined by the Whizzer, the Destroyer, the Angel and the Black Marvel!